End Of Green have finally come back after a break of 4 years. In the past they weren't very happy with their labels and try now their luck with a new South German label called Silverdust. They release their third album Songs From A Dying World which reflects the band's depressive and sad attitude towards life. Influenced by these facts, the musicians play a kind of emotional or melancholic metal, combined with alternative pop elements. Sometimes the deep and dark vocals are sounding like those by Peter Steele and it isn't a surprise that End Of Green covered Black No. 1, a real classic by Type O Negative. But when End Of Green like to present themselves from a more pop or easy listening side, there's a sure parallel to Pyogenesis, especially because of the deeply tuned guitars. But the real highlight on this CD is the eleven minutes long I Hate, a dramatic song that's going deep under your skin. 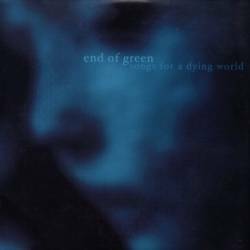 End Of Green have produced a great album and I hope for them that this time they will be more successful than in the past.